Beamish Museum’s accessible bus has relaunched after being rebranded in Venture Transport livery by Go North East. The wheelchair accessible vehicle was formally unveiled at the museum in July after spending some time in our workshops being resprayed in the distinctive yellow, maroon and cream Venture Transport colours. 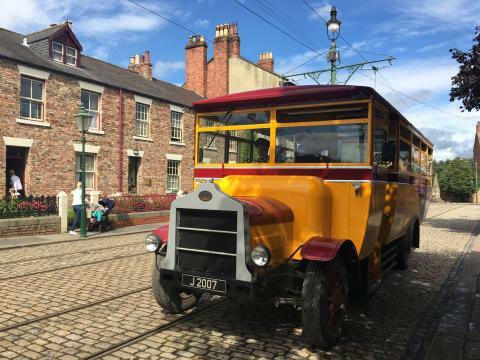 The bus, which was built for Beamish in 2007, is based on the vehicles that existed around 1913. Matt Ellis, Keeper of Transport at Beamish, explained the difficulty of the project. “The accessible bus has to run every day to ensure visitors have access to all areas on site, but we also have to make sure we maintain the upkeep of the vehicle. “We do repairs in small steps and 18 months ago we took it out of service for a fortnight, gutting the inside and installing a whole new floor to industry standard. Then a new tail lift was fitted and the roof was sorted and we’ve now just done the exterior. The final step will be the refurbishment of the interior. Venture Transport was founded shortly after the First World War and was the largest independent bus operator in North East England. It was sold to the Northern General Transport Company in 1970 but the distinctive livery has recently been resurrected for use on Go North East's Consett service. The newly-branded accessible bus was joined for its relaunch on the museum’s 1900s Town Street by a 1963 Leyland Leopard, a genuine Venture vehicle, and a 2013 Optare Solo from our Venture-styled Consett service. 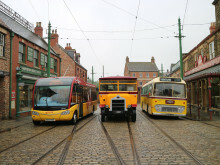 Russell Walker, Tram and Bus Technician at Beamish, arranged the relaunch. He said: “Finding the paint codes for the accessible bus was very difficult, as was sourcing the original logo. A friend of mine, David Heron, who specialises in the making of models of buses, got in touch and he had the codes and the logo we needed as he owns the Leyland Leopard we used for the launch, which he had painted in the original Venture colours. “We also worked with Kevin Laverty, Depot Engineer at Go North East Stanley who sent us the new Optare Solo in Venture livery for the launch. “Seeing all three buses on the street was quite special. It closed the circle for me as I’ve worked in the bus industry all my life, mainly for Go North East.